Telangana and Andhra Pradesh Employees and Teachers availing Health Cards EHS Employees Health Care Scheme by their State Govts Learn here How to Add Remove or Edit Benifishery details in Healt Cards Account by getting Login into their Health Cards Account | Step By Step Process to Edict/Add/Remove their Family Members into their Health Cards Account Know here How to Add or Edit or Remove Employee & Employee's Beneficiary Data on Health Cards HOW TO ADD/EDIT/REMOVE ADDED BENEFICIARY UNDER EHS SCHEME: How to Add or Edit or Remove Your and Your Beneficiary Data on Health Cards, Employee Edit Card Details, How to Add or Delete or Edit your data on Health Cards, Steps for modification of Health Card. 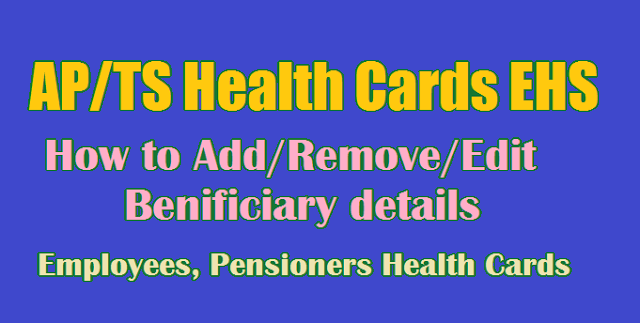 Steps for modification of Health Card: The purpose of this user guide/ procedure/guidelines is to make the user/employee understand how to add beneficiary? or how to remove already added beneficiary? in the EHS scheme. The purpose of the tutorial is to make the user understand how to add beneficiary or to remove already added beneficiary in the EHS scheme. 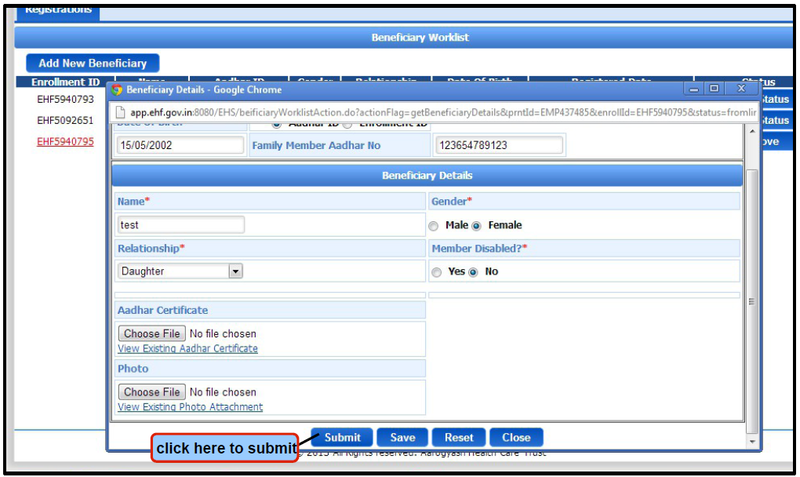 The document will give a complete screen shots of how the employee needs to add/remove beneficiary under the scheme. 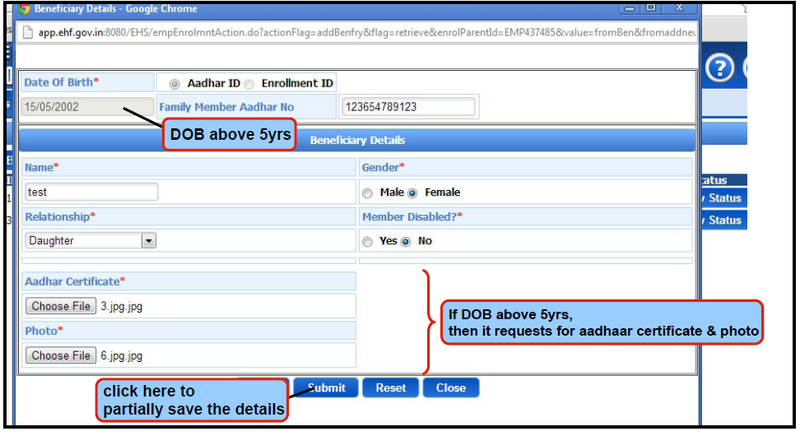 If the dependent family member DOB is above 5years, then it requests for Aadhaar card certificate and Photo. 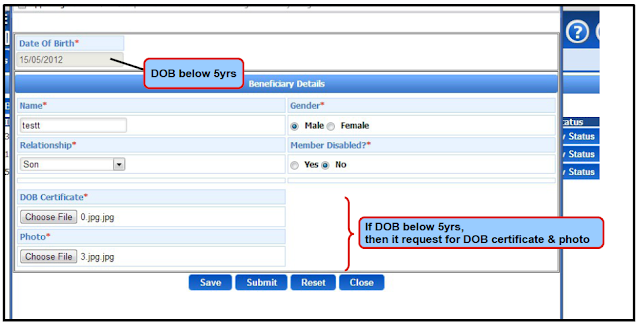 If the dependent family member DOB is below 5years, then it requests for DOB certificate and Photo. Beneficiary once added for any relationship, cannot be added twice in dependent family members details. Son's age greater than 25 can not be added. If son is disabled, then age greater that 25 will be accepted. Dependent's daughter age greater than 25 is acceptable. Relationship and Gender must match. 1. Login to the EHS web portal. 3. Click on 'Registrations' tab as shown in bellow imageInitiate New/Rejected Beneficiaries: This is to add beneficiary or to remove already added beneficiary. NOTE: If the dependent family member DOB is below 5years, then it requests for DOB certificate and Photo. 6. NOTE: If the dependent family member DOB is above 5years, then it requests for Aadhar Certificate and Photo. 8.On clicking 'OK', a page will be displayed wherein the user here has a provision to edit/remove the details of the added beneficiary. 10. NOTE: Once the beneficiary details are submitted, the user will not have any provision to edit/remove the details.